Can the mainstream press fix their online business model? I have a lot of respect for Mark Colvin. He nailed it in the Andrew Olle lecture last week when he said the mainstream media is facing three major crises: authority, credibility and finance. I agree with Colvin that the mainstream press have bungled their business model when moving from print to online. I agree that the loss of traditional newspaper classified revenue has caused their financial crisis. But I also believe the mainstream press are continuing to fail now, not because of their advertising model, but because of the damage they have done to their authority and credibility. If online newspapers could attract enough consumers to achieve the advertising dollars they need to maintain profit, they would have a successful business model. Advertisers only want to be where the consumers are. Without newspapers, they need somewhere to advertise where they can reach their target market. But while the credibility and authority of the mainstream media is in such a mess, so too are their audience figures and therefore so too is their advertising revenue. There is no better example of a significant moment that damages the mainstream press’s authority and credibility than the almost unanimous reporting in the lead up to this week’s US election that the race was ‘too close to call’. This information was handed to us from a platform that is so tainted by the crisis of credibility that it’s no wonder so many of us flood social media to ask each other ‘what’s the real story with this election?’ And we are perfectly justified in our mistrust. Whereas once journalists were seen as our society’s ‘fact checkers’ and were relied upon to uncover information that was useful and relevant to our lives, we now find ourselves in a situation where everything we hear, see or read in commercial media, and even on our government owned media, has to be taken with a pinch of salt. In Colvin’s lecture, he puts the crisis of credibility down to events such as the News Limited Phone Hacking debacle and the BBC’s Jimmy Savile scandal. But I don’t think this is the main cause of the loss of confidence in our media. I think the bigger problem is the way they have reported the news. To put it bluntly, they’re just not very good at their core reason for existence. Instead of information containing interesting and relevant facts, we get trivial nonsense, sensationalised exaggerations of reality, pundits who are campaigning for some vested interest and huge swathes of nothingness on topics that are incredibly important to our society. While newspapers are quickly disappearing across the globe, consumers are expected instead to visit corporate media’s websites to access their news and opinion. However, as I wrote last week, social media has provided consumers with an alternative to the online mainstream press. We now have a place where we can discuss the news of the day, and share it amongst ourselves, without the influence of old media. 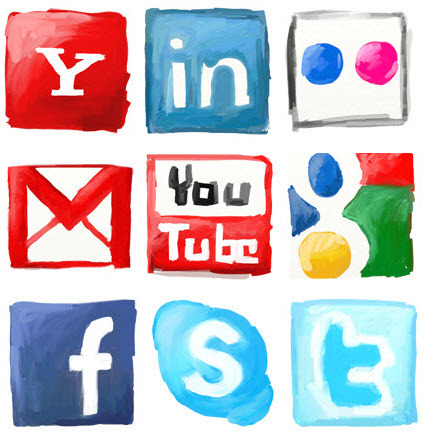 I like to think of social media and independent blogging as the democratisation of media. You no longer have to work for a large corporation to contribute to the conversation. This is obviously incredibly threatening to the media industry, who are used to behaving like dictators – they are used to deciding what we talk about and which information is made available to us. But this has all changed. It’s no wonder that media executives see social media as damaging to their ‘authority’ and in turn their ‘finances’. With more of us on social media than ever before, the media corporations think we’re using it instead of visiting their websites. They correctly think fewer consumers mean fewer advertising dollars or people willing to subscribe to pay-walled content. Fewer consumers also mean less authority – they are no longer ‘important’ if no one cares what they are saying. But it’s not correct to blame their falling audience figures on social media. We’re not leaving them because we’re on social media. We’re leaving them because they are crap. Strangely enough, the one thing the mainstream media is most threatened by could actually be the key to their salvation. Mark Colvin is a great example of a journalist who has successfully used social media to build a loyal platform of media consumers who are interested in what he has to say. As he explained in his lecture, he has learnt to use social media to his advantage by asking his followers for help to provide better information. He asks people to fact-check things for him. For free. He asks his followers to contribute to his content. This produces excellent journalism as the resulting product is not a narrow analysis from a single point of view. I was really impressed by Colvin’s advice to his colleagues to use social media to improve their work. He also makes the very valid point that, in order to maintain their authority and credibility, journalists should be even more rigorous with facts, and make sure that their content is palatable for the social media audience. In other words – they should improve the quality of their journalism so that people actually want to engage with what they have to say. Seems obvious doesn’t it. But in my view, social media offers opportunity for mainstream media beyond what Colvin has identified. “You no longer need Fox News or radio shock jocks to feed your prejudices and screen out the facts. With this statement, it appears Colvin is assuming that social media users are purposely screening out facts that might challenge our prejudices. I think this perception is wrong. Social media users are not using this new media to screen anything out. We’re not wedded to a particular opinion and closing up shop on other views. We are on social media to find out as much information as we possibly can. We want more facts. We want more information. More Nate Silvers. We want more opinions, from more places and more sources. Hence the rise of independent blogging. We don’t just want to read two articles in the Sydney Morning Herald, one in The Australian and two on the ABC and then form our opinion from this limited pool. If the mainstream press can learn what we want, if they stop resenting social media users and embrace this new medium, their profits will return. It all comes down to a very simple concept. If journalists give us high quality, exclusive and informative content and we like what we see – we will make them successful. We will ‘Like’, ‘Share’, ‘Re-Tweet’ and ‘Pinterest’ until there are more visitors to their news sites than there has ever been before. If they truly embrace the power of social media, and write informative, inspiring and relevant articles, we will happily promote them virally across all corners of the social media universe. As it stands, the relationship most mainstream journalists have with social media users is either to ignore us (check out David Donovan’s analysis of how few people well known journalists follow on Twitter), or they’re openly hostile to us engaging with them at all. You only have to see the rate at which the ABC’s Latika Bourke blocks Twitter users to see that she would clearly prefer a one-way-conversation. How this attitude aligns with her title of ‘Social Media Reporter’ is beyond me. So this is my advice to the mainstream media: stop hating social media. Stop being threatened by the idea that news and opinion can be found beyond your revenue-generating-advertising-smothered or sometimes pay-walled content. If you want to deliver profits, you need consumers. If you want consumers, you’ll find them on social media. But only if your product is worthy of sharing. And just a hint on this one – social media users don’t share anything that’s lacking in credibility, as this affects our individual credibility. And maybe say something that matters (take Rachel Maddow’s advice). Before there was the internet and social media, we read newspapers to learn more about the world. We still crave information, and now we have a much better vehicle to share the best bits we find. Once you understand that, the media world is your oyster. I would add to the quality Of Mark Colvin’s work, Kay and Victoria Rollison. Quality and hitting hard to the core issues. Thankyou so much (again). Well written and this blogg is an excellent example of the new media that people who crave news are reading. I follow many of the sites via Word Press. Give me a choice of biased MSM with a pay wall and many differing views, both opinion and investigatory, blogg sites and you don’t have to guess where I will go. MSM if they had dropped their arrogance could have been on top of the world. Just look at Google, all the services that they provide to the world for FREE and does their model work? There are problems for the free service but you can avoid these with a little bit of thought. One of the biggest hurdles with these changes has been for the pollies. Statements made can be researched and validity checked within minutes. This result is the best change in information technology in my lifetime and I am an old geriatric. Please Independent bloggers keep up the great work that you do. You have my support and admiration. Something that the MSM is going to find hard to gain. If you take Piers Akerman’s article/blog for example, his writing is so tainted with his anti-Labor rants on a daily basis that it really does not serve any purpose except to stir his followers into a frenzy. He has the same people commenting everyday and he refuses to post comments from others who disagree or challenge his point of view. He is very old school and the fact he is not embracing new forms of media will be to his detriment. Australian media (for the most part) is antiquated and refuses to concede. I have become so much more aware of local, national and international politics and news since being on Twitter and by reading blogs such as this one.